From the original DNA template, the sequencing reaction synthesizes a new DNA strand that incorporates a set of fluorescently-labeled ddNTPs into the DNA (centre). The newly synthesized DNA is separated by size in an electrophoretic field, and the fluorescence colours are activated by a scanning laser, tracked, and read by a photometer. 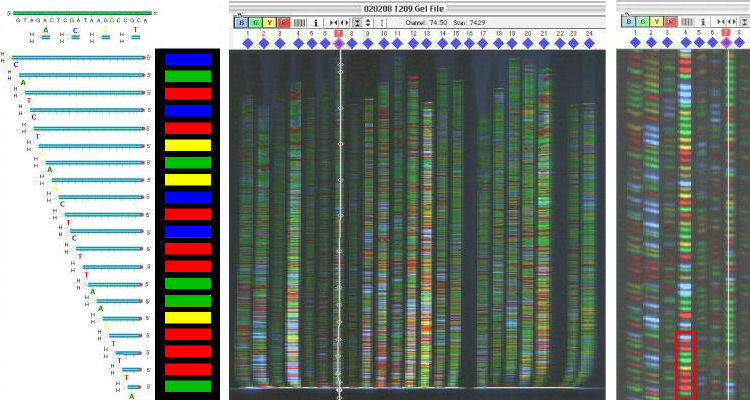 The gel image (left) is a "false colour" representation of 24 different DNA sequences, each lane from a separate sequencing reaction; automatic tracking for one lane is shown by the white trace. In the magnified view (right), the sequencing ladder in each lane has four different coloured bands that correspond to each of four DNA bases: A C G & T. Each channel is converted to an individual chromatogram for that DNA sequence; the order of coloured peaks is converted to a DNA sequence. For example, the first few bases of the fourth lane will be read as ATTTGAATTC . [Click here for an animation]. HOMEWORK: Popular accounts (like "Jurassic Park") suggest that "DNA sequences are read by a laser'" Explain why this is incorrect. Images & text material © 2015 by Steven M. Carr.